you' re reading this at the weekend). 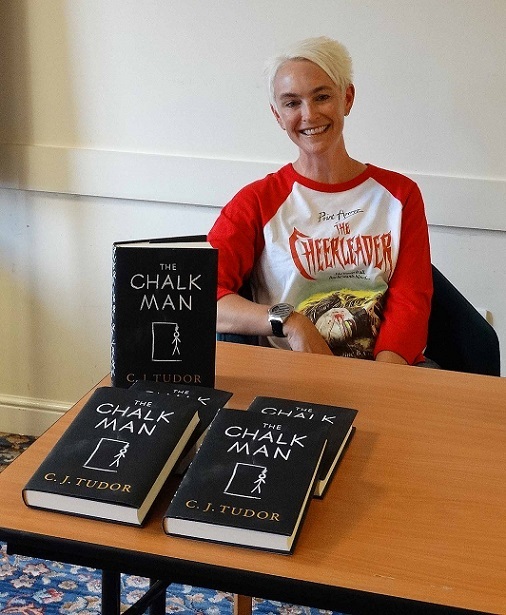 The guest speaker was author C.J Tudor, whose debut novel 'The Chalk Man' was published this January in hardback; there will be a paperback later this year. As Caroline is a local author the club was already connected on Twitter, so that made arranging the talk much easier for me; being able to suggest what we'd be interested in hearing about and adapting to her way of working. We heard about her journey to publication with the "little notes of hope"- the comments she received from agents she'd submitted her earlier books to; but it was clear that the process can be long and the path not always smooth just getting an agent. 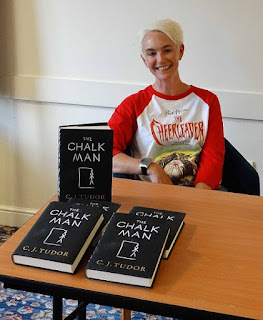 The insights into the actual publishing process (once The Chalk Man manuscript was accepted- after an auction) was something many writers don't usually hear about. Anyone who ever wondered why it takes so long for a book to be published- about 2 years- would have understood why, after Caroline explained the process she and her book went through. Editing and more editing featured heavily. But it did also give some useful insights that self-publishers can learn from. Creating a buzz using social media and the value of book bloggers, especially with debuts. The value in getting pre-orders and the concentrated effort needed the first two weeks the book comes out. 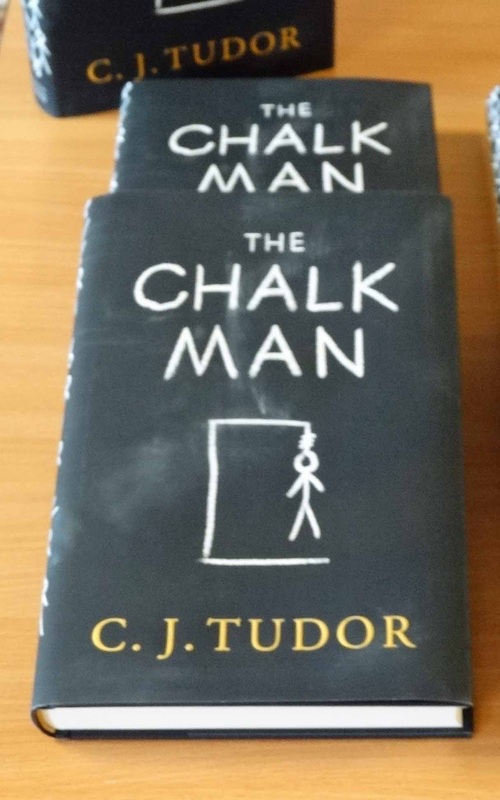 All writers are aware of book covers, so it was surprising to hear why the cover of The Chalk Man had to be changed for the US market; they had an orange cover. Caroline's talk was entertaining, and interesting. She is a pantser as a writer and her talk was that way too, but it worked well. That sounds like an interesting evening, Carol. It's sounds as if it was a great evening at Nottingham Writing Club. So interesting to hear that covers need to be different in the US. Perhaps they never had blackboards! I agree with everything you said here, Carol. It was a brillant evening. You deserve credit for getting her to come and speak at NWC. That sounds such an interesting talk, Carol! Patsy- it was very interesting. We got an insight into so many things. Angela- I've often wondered about the differences there are in book covers in the US compared to the UK. Perhaps there's specific associations with black covers that we don't have in the UK. Keith- thanks. Glad you enjoyed it. Just hope all the speakers this year get such a positive reaction. Rosemary- it was very interesting, and a reminder never to stop trying. It can take a age to get to publication. I'm struggling with a cover design at the moment; but I don't think I'll be troubling the USA with my book, so at least that's one problem I don't have! Julia- yes, after hearing the process Caroline's book went through I now understand why it takes so long. Covers seem to have become more important than they were even a decade ago; with so many outlets for book exposure it's understandable that the cover is as important, if not more so, than the content for getting the readers attention.